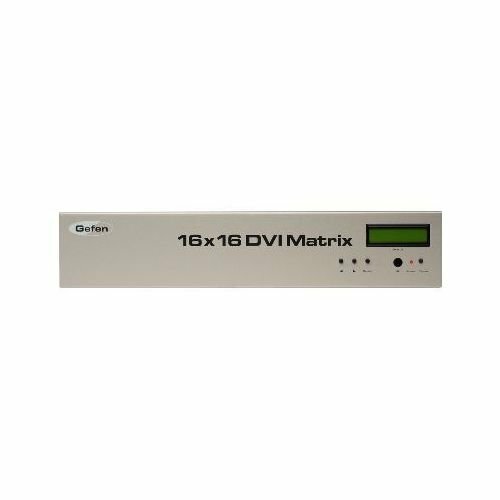 Now you can easily combine sixteen cross-platform computers and sixteen digital displays using the EXT-DVI-16416 Matrix Video Switch. The EXT-DVI-16416 Matrix Video Switch provides a simple, reliable and highly effective method of routing multiple computer workstations. Each computer is capable of displaying video on any one of the 16 monitors. There are 4 methods of controlling the EXT-DVI-16416 Matrix Video Switch by using the front panel buttons, the IR remote, a built-in RS-232 interface, and IP control over a local area network.